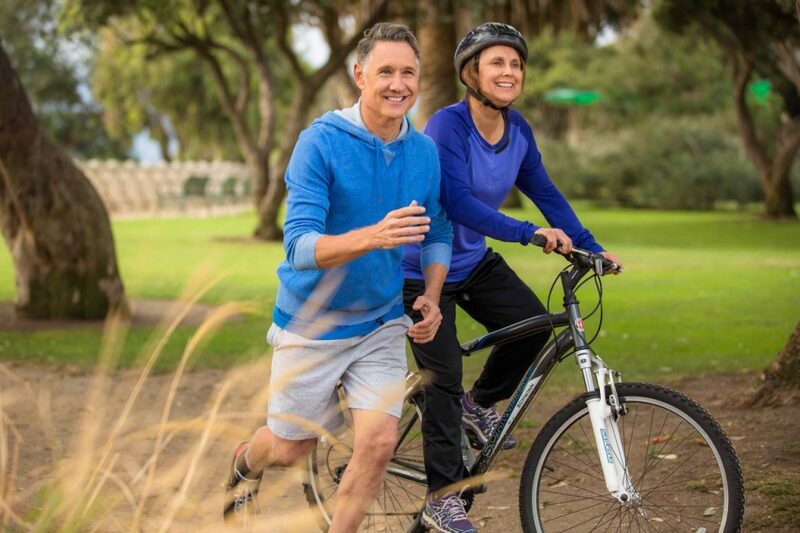 With a large portion of Kelowna’s population falling into the “Over 40” category, it is important for people to work out safely and effectively to get the results they crave. From gym nutrition, to one on one fitness routines, or group fitness classes, One Life Health and Wellness is your fitness trainer in Kelowna with the cardio over 40 options you desire. We offer group fitness, private groups (workout with your co-workers!) or individual sessions to provide you with a customized gym combination workout to build your core, improve your stamina, offering mind and body benefits. You don’t have to be prepping for fitness pictures or engaging in obstacle race training in order to commit to being fit. Of course, if you are seeking tough mudder training exercises, we can happily incorporate them into your workout! Maintaining flexibility and a healthy weight are vital for your knees, back and entire well-being. Stretching and cooling down become equally important parts of your exercise routine to prevent injury. As we age, our muscles and bones become weaker and potentially more brittle. Squat alternatives may become your new best friend if you have worn away some of your precious cartilage. Our tissues can become tighter and less hydrated over time, wreaking havoc on our ability to exercise and dramatically affecting our recovery time. Cardio over 40 is possible and highly recommended for cardiovascular and musculoskeletal health, however, it is wise to know your limit and set attainable goals to work toward. Imagine losing approximately three to five percent of muscle mass every decade you are not active! You can imagine how significantly your body image and quality of life would be different. Sarcopenia with aging is the medical term for this muscle change. Our hormones are fluctuating and changes to metabolism, coordination and reflexes can play a part. Losing muscle mass doesn’t have to become such a noticeable reality if remain active and include weight-bearing and flexibility-building exercises into your routine. After all, 40 is being hailed the “new 20!” You may find yourself in the best shape of your life and your favourite fitness trainer in Kelowna promises to make it fun! Did you know that it is common for folks to lose approximately half an inch in height every ten years after they turn 40?! Dehydrated spinal discs, weight changes and differences in bone mass can lead to a shrinking effect. Keeping your circulation active and maintaining blood flow throughout your tissues with diet and exercise is essential to feeding your body the nutrients it needs to succeed! One Life Health and Wellness offers nutritional counseling to help clients maximize their dietary considerations. You may wish to experiment with protein powders, tasty shakes, or glucosamine and chondroitin for your joints and other nutritional boosts to help you feed your body and mind. It is always easier to complete cardio that you enjoy. If your knees are healthy and you love spin class, this is an option. Perhaps, group fitness classes are not your favourite but you enjoy the self-defense aspect of training a Martial Art. Benefits of weightlifting and cardio include preventing stroke and cardiovascular disease, eliminating back pain, osteoporosis, high blood pressure, obesity and diabetes among others. The psychological benefits of improved self-esteem and better sleep are popular side-effects too! It is never too late to start and everyone began with one step. If 2019 is the year for you to realize your health and wellness goals, One-Life Fitness is excited to be a part of your transformation. Regardless if you are visiting us to overhaul your workout or require some high end rehabilitation, our experienced team is ready to take your exercise capacity to the next level. Fitting in a workout can seem impossible for some people’s busy schedules. We recommend starting small. Find a good multivitamin that your body likes. Consider supplementing with omega fish oils provide your joints with internal lubrication while positively benefiting your brain, focus, hair, skin and nails. Book a walk around the block with your family members or friends. Many forty-somethings will have kids or a spouse to coordinate exercise time with. Stay motivated and try one on one fitness training with one of our talented staff members to discover new exercises that are specifically suited to your mobility and your goals. Understand that the struggle is real and there are going to be days when you are too fatigued with life to make it to the gym. View improving your balance and muscle tone as a positive place to start. Have alternative plans including at home yoga or Pilates workouts on hand to keep you active in between gym days. We would love to help you address your health and wellness goals Kelowna! Enjoy the best your mind and body have to offer by staying healthy, fit and fabulous! Experience more energy and love your reflection in the mirror. Your heart, muscle and bone health will reap the rewards along with your mind, body and soul. Book a team training group fitness class, one on one fitness training or nutritional counseling with us today to get started! We are conveniently located on Spedding Court and look forward to seeing you soon!